A significant Chinese slowdown may already be unfolding. “It ain’t what you know that gets you, but what you think you know for sure that just ain’t so,” as the old adage goes. Over the next two years, the biggest risks to the global economy lie exactly in those areas where investors believe recent patterns are unlikely to change. Major risks include a growth recession in China, a rise in global long-term real interest rates, and a crescendo of populist economic policies that undermine the credibility of central bank independence, resulting in higher interest rates on safe, advanced-country government bonds. A significant Chinese slowdown may already be unfolding. President Trump’s trade war has shaken confidence, but this is only a downward shove to an economy that was already slowing as it makes the transition from export and investment-led growth to more sustainable domestic consumption-led growth. How much the Chinese economy will need to slow is an open question, but given the inherent contradiction between an ever-more centralized political system and the need for a more decentralized consumer-led economic system, the long-term growth slowdown could be quite dramatic. Unfortunately, the option of avoiding any transition and just continuing to promote exports and real estate investment is not very attractive either. China is already a dominant global exporter, and there is neither market space nor political tolerance to allow it to continue export expansion at its previous pace. Keeping up growth through investment is also ever more challenging, particularly in the residential real estate that accounts for the lion’s share of the Chinese construction industry. Downward pressure on prices, especially outside Tier 1 cities, is making it increasingly difficult to induce families to invest an even larger share of their wealth in housing. While China may be much better positioned than any Western economy to socialize any resultant losses that hit the banking sector, a sharp contraction in housing prices and construction could nevertheless prove extremely painful to absorb. 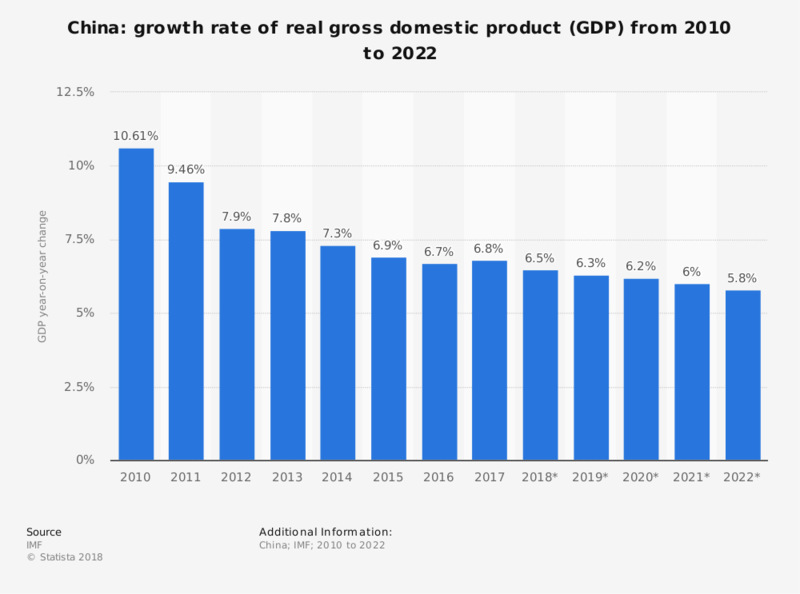 Any significant growth recession in China is going to hit the rest of Asia hard as well, and will slam commodity-exporting emerging markets and developing countries. Europe is already feeling pain, especially Germany. Although the US is less dependent on China, the trauma to financial markets and politically sensitive exports could make a Chinese slowdown much more painful than US leaders seem to realize. A less likely but even more traumatic outside risk would occur if after many years of trend decline, global long-term real interest rates reverse course and rise significantly. I am not speaking merely of a significant overtightening by the US Federal Reserve in 2019. This would be problematic, but it would mainly affect short-term real interest rates, and could be (in principle) reversed over time. Instead I am focusing concern on the risk of a shock to very long-term real rates, which are lower than at any point during the modern era (except for the period of financial repression after World War II, when markets were much less developed than today). While a sustained rise in the long-term real interest rate is a low probability event, it is far from impossible. Although there are many explanations of the long-term trend decline in interest rates, some factors could be temporary, and it is difficult to establish empirically the magnitudes of different possible effects. What could cause global rates to rise? One factor, on the benign side, would be a spurt in productivity - for example, if World Economic Forum founder Professor Klaus Schwab’s Fourth Industrial Revolution starts to impact growth much faster than is currently anticipated. This would of course, be good overall for the global economy, but might greatly strain regions and groups that fall behind. Another less benign factor would be a sharp trend decline in Asian growth - from a China trend slowdown, for example - that could shift the long-standing Asia surplus to deficit, putting upward pressure on global rates. But perhaps the most likely cause of higher global real interest rates is the explosion of populism that is taking place across much of the world. To the extent that populists can overturn the conservative market-friendly pro-globalization economic policies of the past few decades, their actions may sow seeds of doubt in global markets about just how ‘safe’ advanced country debt really is. This could raise risk premiums and interest rates, and if governments were slow to adjust, budget deficits would rise, markets would doubt governments even more, and events could spiral. Most economists agree that with today’s lower long-term interest rates, advanced economies can sustain significantly more debt than they might otherwise; but the notion that it is a free lunch is foolish. High debt levels make it harder for governments to respond aggressively to shocks, whether it be a financial crisis, a cyberwar, a pandemic or a trade war that blows out of proportion. The inability to respond aggressively to major shocks significantly heightens the risk of long-term stagnation, and is an important explanation of why most serious non-political academic studies find that very high debt levels are associated with slower long-term growth. If progressive policies rely too much on debt (as opposed to higher taxation on the wealthy) in order to redistribute income, it is easy to imagine markets coming to doubt that countries will grow their way out of very high debt levels - and if they do, it could well push interest rates up to uncomfortable levels. Of course, there are many other risks to global growth, including ever-increasing political chaos in the US, a messy Brexit, Italy’s debt problems and heightened geopolitical tensions. So with all these outside risks, is the outlook for global growth necessarily grim? There are also upside risks. The baseline case for the US is still strong growth, and Europe’s growth could be above trend as well as it continues its long, slow recovery from the European debt crisis. The Chinese economy has been proving its doubters wrong for many years. So 2019 especially could register as another year of solid global growth. But unfortunately, it is more likely than not to be a nerve-wracking one.